**Special** Winter Discounts from our Practitioners!!! 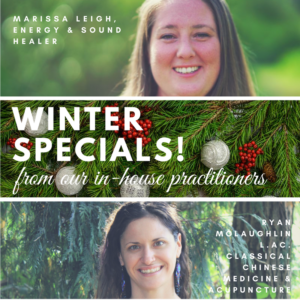 Our lovely in-house practitioners at SomaSpace are offering **special** discounts for this winter season!!! Keep reading to learn more about what they do and their unique offerings!!! The season has shifted and brought us into the time of shorter days and longer nights. Watching the golden sun set in the early afternoon I am reminded of the way this time invites us to settle into the darkness while it is here, to turn inwards, to find quiet space to allow our minds to rest and our hearts to unfold. Time seems to slow in the winter and the cold and damp call us inside to be safe, warm and cozy as we are given space for our bodies and minds to rest and be nourished. You are invited to rest yourself on a warm and comfortable massage table and to leave the world at the door for a time while being supported by Reiki energy or the tones of the crystal singing bowls this winter. Reiki is a very gentle healing modality that works on an energetic level and has many physical and emotional benefits. It promotes deep relaxation which is essential to your body’s healing process and which we rarely experience in our daily lives. Marissa Leigh works 1-on-1 with individuals to provide them with a restful and nourishing space to be fully present with whatever is alive in the moment for them. She provides gentle guidance for individuals to open fully to themselves to allow their bodies, minds and hearts to heal what they feel must be healed. This looks different for everyone but is in essence allowing ourselves to return fully to experiencing the joy of our true being exactly as it is. Marissa offers sound healing using seven crystal singing bowls. The medicine of these bowls is grounding and clearing, helping us quiet our minds and open our hearts. This allows space for our body, mind and spirit to return to harmony. This harmony supports our body’s natural healing process. Ryan McLaughlin is passing along her excitement about joining the Somaspace family to you by offering a $40 discount on all new patient appointments scheduled between 12/1/17 and 1/31/18. Offerings include acupuncture, acupressure, bodywork, herbal and dietary recommendations, and other modalities within the realm of Chinese medicine. She looks forward to meeting members of this beautiful community as we refine our dance to the natural rhythms of health. At the deepest darkest time of the year, our society continues to encourage us to focus ourselves outward- giving to others, socializing, indulging in the season’s treasures. This package encourages and celebrates your commitment to self-care through offering you discounted rates to keep you centered, grounded, and nourished this winter season. Using a combination of acupuncture, bodywork, herbal medicine, food recommendations and/or movement recommendations- refining your natural rhythm of health this winter will be completely supported. This package includes a 90-minute new patient office visit, and two 60-minute follow up appointments- a $280 value! The first appointment is to be scheduled before the end of January. Ryan McLaughlin, L.Ac., a practitioner of classical Chinese Medicine, is dedicated to creating individualized treatments that harness and compliment the innate healing wisdom and mechanisms of the body. Utilizing acupuncture, bodywork, cranial sacral, shiatsu, qi gong, herbal medicine and food recommendations, Ryan gently and directly addresses underlying patterns in the body that are contributing to the myriad of symptoms that may bring a person in for care. Ryan is passionate about guiding patients back into deeper connection with their bodies, community and natural world, as they find the trail back to feeling empowered to care for their own health.